Summer rhymes with danger : if heat is on the door, overheating is close ! Our body consists of more than 50 % water (55 to 65 % for women, 60 to 70 % for men). A sedentary adult looses between 2 and 3 liters per day. Half of it gets compensated by the food absorbed, half by the water. In the case of endurance efforts, hydration becomes essential, if not vital, for the proper functioning of the body. Any loss, even minor, affects performance. Severe dehydration can cause disease that can result in death. Hydration is crucial in any endurance activity. Poor hydration leads inevitably to poor performances and can cause tendinitis and other health problems. The endurance athlete must drink on a regular basis before, during and after exercise. A sedentary adult looses between 2 and 3 liters of water per day. Elimination occurs through urine (1 to 1.5 liters), breathing (300 to 600 ml), sweating at rest (400 to 1000 ml), tears and stool (50 to 200 ml). These losses are compensated half by food and half by water absorption. When doing sport, sweating is the biggest source of water loss. It represents up to several liters per hour ! Under these conditions, hydration becomes vital. In case of dehydration, the volume of water contained in blood plasma decreases, making the blood thicker. It takes the heart more efforts to propel it through the vessels. As blood circulation in small capillaries becomes more difficult, the oxygen and nutrients rate supplying the muscle decreases along with its ability to eliminate toxins. This decrease in blood volume will furthermore require the heart to beat faster to maintain blood pressure. Under these conditions, performance will decline : a loss of 1% of body weight in water implies a decrease of 10% of physical abilities ! Water is acting as a lubricant to tendons and contributes to the elimination of nitrogenous waste. Depletion can cause tendinitis. Kidney stones can also appear following the reduction of irrigation of the kidney. Last, the athlete's hydration helps cool down the body during an effort. If this function is no longer ensured, a thermal shock can occur : the heat stroke. Heat represents about 80% of the energy spent in an athletic effort. Perspiration helps the body cool down. This process requires large quantities of water. Severe dehydration can lead to overheating, a bit like an engine deprived from coolant. This is commonly called heat stroke. High temperatures, high humidity, a lack of ventilation, a lack of water, vigorous activity in the hot sun can cause heat stroke. During heat stroke the body temperature rises and exceeds a critical threshold. This leads to headaches, fast heartbeat, a drop in blood pressure. Heat stroke is a serious issue that can lead to neurological sequels or even death. It must be treated immediately. To prevent heat stroke, drink plenty of water, avoid workouts by high temperatures, splash water when climbing passes, keep your shirt wide open, prefer shaded routes, stop immediately in case of heat disease symptoms (headache, goose bumps, nausea, dizziness). In case of heat stroke, immediately seek for medical or first aid. While waiting for their arrival, hydrate the victim to reduce their body temperature. Place them in the shade, open or remove their shirt, immerse them in cold water or, failing that, spray them with water, make them drink. In case of unconsciousness, place the person in the recovery position. a drop in performance (fatigue, breathlessness, heaviness in the legs, tendinitis, ligament and muscle aches). When these signs appear during a major athletic effort, it is already too late to take action. The absorptive capacity of the stomach being insufficient to catch up, dehydration is inevitable. You must drink before, during and after exercise. Drink the eve of the race until going to bed in order to remain well hydrated. An hour before exercise, drink a carbohydrate-based drink containing a low dose of sugar (20 g/l). Prefer fructose to sucrose to avoid hypoglycemia due to insulin production (more information). When exercising, drink before feeling thirsty. The sensation of thirst indicates severe dehydration (20% of body needs) which will be impossible to catch up. Also note that our stomach can not absorb more than 75 cl of liquid per hour. So drink regularly and in small quantities. Hydrate after exercise and until bedtime. After an hour of vigorous activity, pure water can cause hyponatremia (sodium deficiency). To avoid this problem while replenishing lost carbohydrates and electrolytes, buy or prepare isotonic drinks. Prefer you drink cool, if possible, but never frozen. One drink too cold can disrupt digestion and cause intestinal upsets. 15 ° C is an ideal temperature. Wear light-coloured and loose-fitting clothing. Prefer jerseys with a full zip that can be opened completely in the climbs. Choose a helmet with good ventilation. Wear a cap under the helmet and spray it with water. A bandana can be useful for absorbing perspiration from the head. Use a thermal flask to keep your drink at a suitable temperature. 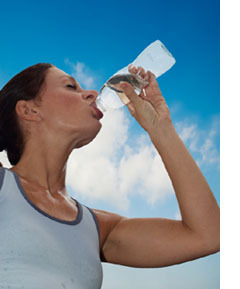 Drinking too much water can cause hyponatremia, i.e. overhydration of cells that leads to the dissolution of sodium in the blood. This condition can cause physical symptoms such as nausea, distaste for water, vomiting, lethargy, disorientation and even seizures, respiratory distress, loss of consciousness or even death.